How would you rate your cybersecurity knowledge? Have you ever wondered how secure your data is or which cybersecurity questions are the most relevant to your work or personal life? We’re here to guide you through the world of cybersecurity and help you figure out what courses you can take to excel in your career or simply feel confident using a computer. Cybersecurity is a huge field with topics ranging from the highly technical to basic concepts that everyone who uses a computer should know. We all want to do whatever we can to protect our personal data from credit card or identity thieves. Businesses and governments want to avoid being hacked, and perhaps even worse are reports of 1.1 billion records of sensitive data being accidentally published or poor security allowing easy access to credit card information, not to mention DDOS attacks being used to manipulate elections. These days, cybersecurity knowledge is becoming more important for everyone. Cybersecurity is everywhere. It’s your firewall, your anti-virus, fault-tolerant architecture, and 2-step authentication. Cybersecurity is also using different passwords for different accounts, it’s avoiding using your credit card on unsecured public wifi, it’s ensuring that your company’s sensitive data is only stored on encrypted hard drives, and it’s closing your laptop screen before you get up a little too eagerly when the barista calls your name. Cybersecurity is the collection of all of the tools and practices for protecting the computers, data, networks, and programs we rely on every day from damage, outage, or unwanted access. There’s a lot that goes into cybersecurity, and you probably don’t need to know all of it. The handy graphic below gives a basic idea of who needs to know what sorts of topics based on common job roles. Whether you use your desktop to send emails and write copy for work or use your phone for social media you are leaving digital footprints for anyone with the know-how to collect and follow. Coursera offers single courses like Cybersecurity and Its Ten Domains from The University System of Georgia to give the casual user a chance to learn the basics of cybersecurity. Usable Security from The University of Maryland, College Park provides the basics and a high-level introduction to how security is designed into systems, networks, and software. For the executive, entrepreneur, or manager that may need more advanced security knowledge but not necessarily the nuts and bolts cryptography and scripting skills, there’s Cybersecurity for Business from the University of Colorado and Cybersecurity: Developing a Program for Your Business from University System of Georgia. Developers can add the skills that ensure security is part of the development process with The University of Colorado’s Secure Software Design Specialization or, for more advanced developers with a background in C programming the University of Maryland offers their course in Software Security. IT Professionals such as system or network administrators have a number of options for advancing their security knowledge. Practitioners new to cybersecurity may want to start with the Introduction to Cyber Security specialization from The Tandon School of Engineering at New York University which offers a great base of applied knowledge for enterprise cybersecurity. Specific topics in cybersecurity range from University of Colorado’s specializations in the Fundamentals of Computer Network Security or Computer Security and Systems Management up to courses for the Systems Security Certified Practitioner (SSCP) from (ISC). Security professionals who need skills and knowledge that is more advanced than the offerings above may find what they’re looking for in University of Colorado’s Advanced Systems Security Design Specialization. Alternatively, those with an electrical engineering background may find the Hardware Security course from the University of Maryland to be exactly what they need. 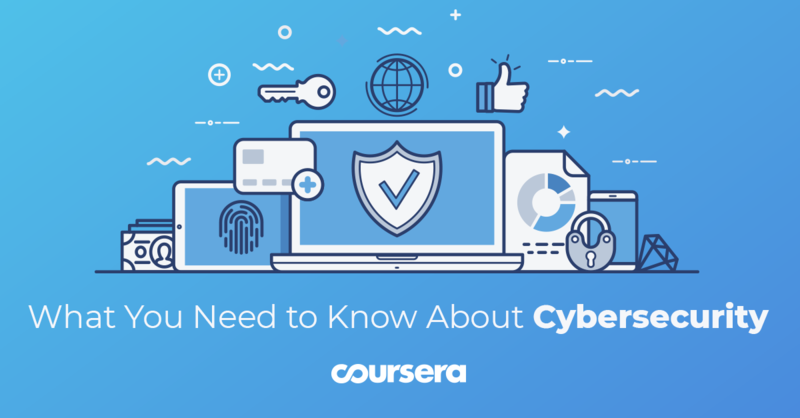 Whether you manage enterprise security for a Fortune 500 company or just need to protect your personal information, Coursera offers something to meet your cybersecurity knowledge needs. Explore more Cybersecurity courses and Specializations here.